The New York Times published an article titled "How China Got Sri Lanka to Cough up a Port" on Monday June 25, 2018 and our political opponents have made quite a carnival of it, marching to the FCID to make complaints, holding press conferences and calling for Presidential commissions of inquiry. However, the main allegation in this article - that $ 7.6 million had been given to me as campaign contributions by China Harbour Co. during the 2015 presidential elections - is based on a Reuters report that appeared three years ago in July 2015. At that time, the new Yahapalana Government had suspended all Chinese-funded projects and all Chinese firms, including China Harbour Co. which was building the Colombo Port City, were being investigated. More than a year later, this Government cleared China Harbour Co. of any wrongdoing and the Port City project was handed back to them. No contribution was made by China Harbour Co. to my 2015 presidential election campaign. While claiming that my 'affiliates' and 'campaign aides' had got the money and that 'volunteers' had delivered the cheques to Temple Trees, the writer of the New York Times article has been intentionally vague about who had given this money and who had received it. This seems to be a way of carrying out a smear campaign without incurring any liability. 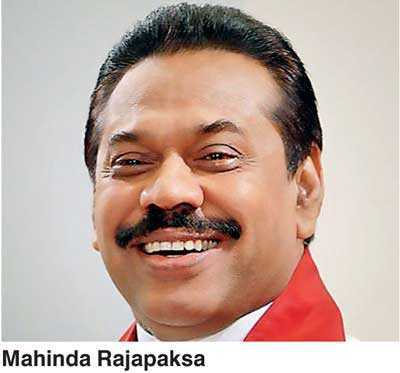 The Prime Minister himself has gone on record, describing the Colombo Port City as the premier project on which his Government has placed its hopes. If any election campaign contributions had been made to me by China Harbour Co., the Port City contract would not have been restored to them, and neither would they have been allowed to bid for the lease of the Hambantota harbour. The NYT writer has stated that they had obtained some of the details in that article from a Sri Lankan 'government investigation'. Every Sri Lankan knows that the main preoccupation of this Government since it came into power has been to sling mud at the opposition. The NYT writer alleged that China financed the Hambantota Port project with the ulterior motive of ensnaring Sri Lanka in a debt trap even though the feasibility studies said the Port would not work. That is not true. One of the world's foremost engineering consultancy firms, Ramboll of Denmark, was identified by the Chandrika Kumaratunga Government to do the first feasibility study, but that Government was defeated before the study could get off the ground. Then, the Ranil Wickramasinghe Government commissioned another top engineering consultancy firm, SNC Lavalin of Canada, which completed its feasibility study in June 2003. In 2004, under the second Chandrika Kumaratunga Government, Minister Mangala Samaraweera commissioned Ramboll of Denmark again to do a feasibility study, and this was completed in 2007. Thus, two feasibility studies under two different governments recommended the building of the Hambantota Port. The loans taken to build phases I & II and the bunkering facility of the Hambantota harbour amounted to around $ 1,322 million. The NYT writer alleged that the initial loan of $ 307 million had been renegotiated to a 6.3% fixed rate after having been taken initially at a concessionary rate. The intention was to make the point that China was lending at exorbitant rates of interest. This initial loan was taken at the LIBOR (London Interbank Offered Rate) benchmark rate plus 0.75%. During that period, the LIBOR increased, pushing up the actual interest rate of the initial loan to 6.5%. It was then that a fixed rate of 6.3% was negotiated. However, the remaining $ 1 billion was taken from China at the concessionary interest rate of 2%. The writer states that loans could have been taken from other countries at an even lower rate of interest. However, in taking project loans, the interest rate is not the only criteria to be considered. When such bilateral agreements are entered into, the lending nation recommends the contractor and the price quoted by this contractor has to be taken into account also. In that respect, China provided the best deal. The Hambantota Port was actually built at a lower cost than the estimates in the Ramboll and SNC Lavalin feasibility reports. The Hambantota Port is deemed to have failed because it drew only 32 ships in 2012 compared with 3,667 ships at the Colombo Port. However, the NYT writer fails to mention that this increased to 335 in 2014. The Port made an operating profit of Rs. 900 million in 2014 and Rs. 1,200 million in 2015. These are investments that last centuries, and a new harbour that opened in 2011 cannot be expected to produce profits by 2012. The writer further claims that the present Government was compelled to lease the Port to China because they were unable to repay the loan taken to build it. The total cost of financing the Hambantota Port (capital plus interest) will be $ 1,761 million by the time the loan expires in 2036. By the end of 2016, nearly $ 500 million of this total amount had already been repaid. There was never any problem about meeting the payments for the Hambantota Port because it was paid out of the profits of the Sri Lanka Ports Authority (SLPA). The Auditor General's report for 2014 states that the profit of the SLPA in 2014, after paying all loans and taxes, was Rs. 8.8 billion. Even though the NYT writer appears to be unaware of it, every Sri Lankan knows that the Government did not use the $ 1,120 million received from the Port lease to repay the loan taken to build it. Instead, it went to the Treasury to meet the day-to-day expenditure of the Government, and the loan still remains on our books. Though the writer claims that China has got the Hambantota harbour (with its industrial zone of 5000 acres) and an additional 15,000 acres from Sri Lanka due to the debt trap that China inveigled Sri Lanka into, there was never any Chinese debt trap as alleged. The SLPA had made careful plans to raise the money to meet the loan repayments until the Hambantota Port broke even. This included the development of the Colombo East container terminal, which was expected to bring in an additional income of $ 100 million a year to the SLPA. When my Government was voted out, we had already signed a Supply Operate and Transfer contract with China Harbour Co. and China Merchant Co. to operate the Hambantota container terminal for 40 years. The other terminals and the 5000 acre industrial zone in the harbour were to be controlled by the SLPA. We never had any plans to lease the entire free Port for 99 years to any foreign company. That took place under the present Government, which was installed in power by the very western nations that are now complaining about the Chinese presence in Hambantota. When I was President, China never asked for the Port on lease or for any land outside the Port. It is the present Government of Sri Lanka that proposed to China that they take the entire free Port on lease. The NYT writer states that the lease of the Hambantota Port gave China control of territory close to the shores of India, and that India was now apprehensive about the uses that this Port may be put to. Such a situation would never have arisen if my Government had continued in power. Former Indian External Affairs Secretary and National Security Advisor Shivshankar Mennon has said in his 2016 book ‘Choices: Inside the making of India's foreign policy’, that my Defence Secretary, Gotabhaya Rajapaksa, had a clear view of Sri Lanka's interests, which was completely compatible with India's interests, and that India had been given assurances about the nature of Sri Lanka's relationship with China. Mennon further stated that Gotabhaya was sensitive to India's concerns, and that the assurances given to India by my Government were respected throughout the duration of the Congress Party Government which was voted out in May 2014. The New York Times has described me as China's preferred partner in Sri Lanka. Given what has taken place after 2015, I have no doubt that I am now the preferred partner of India as well.